Hundreds of nurses will rally at the Oregon State Capitol in Salem on Tuesday, Feb. 5, 2019 to advocate for our patients and advance Oregon nurses’ practice. Join hundreds of nurses and nursing students at the State Capitol in Salem. ONA will provide resources, materials and training to all attendees. First-time participants are welcome. ONA Nurse Lobby Day is open to all ONA members and student affiliates (Oregon Student Nurses Association members). It’s vital that we have nurses represented in the discussions and decision about the issues that matter most to us this legislative session. All ONA members and nursing students affiliates are invited to ONA Nurse Lobby Day. If you aren't a member of ONA or a nursing student and are interested in joining us for Nurse Lobby Day, please contact Catie Theisen at Theisen@OregonRN.org. Online registration is now closed. If you are interested in attending but were unable to register, please contact Catie at Theisen@OregonRN.org to check on space availability. While the exact agenda will not be available until closer to the event, participants should plan on joining us in Salem from 8 a.m. to 5 p.m. The morning part of the day will be dedicated to learning about the key issues impacting nurses and nursing practice and training on how to effectively lobby on the issues. The later part of the day will be meeting with your legislators to talk about the issues and advocate for priority legislation. 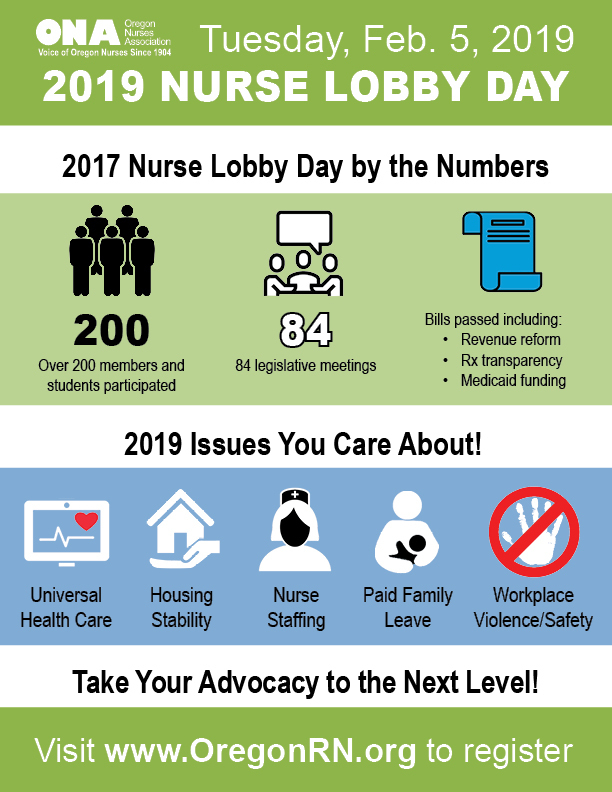 View an infographic with a list of issues we'll be working on in the legislature this year along with information about our successful 2017 Nurse Lobby Day. On Tuesday, Feb. 5, please plan to arrive at the Micah building at the First United Methodist Church at 680 State St, Salem between 8-8:30 a.m. to pick up a parking pass and check in for the day. ONA will subsidize parking for Nurse Lobby Day participants, with a suggested cash donation of $5 to cover the rest of the cost. You can plan to pick up a pass from staff outside of the Micah building and allow enough time to park and return to the event space by 9 a.m. Click here for a parking map that also includes other non-ONA sponsored parking options. Learners can earn 2.5 continuing nursing education contact hours. The planners/presenters for this CNE activity declare no conflicts of interest in the development and implementation of this educational activity. The presenters have attested that they will provide the best available evidence for this content and present information fairly and without bias.